Our customers on the Top Performance program enjoy an inspection and tune-up of their systems twice a year. Other companies offer “bargain inspections.” They often spend less than 45 minutes, not nearly enough time to be thorough. Coils will be cleaned in place with self-rinsing cleaning. More extensive cleaning, if necessary, will be an extra charge. Drain pipes will be cleaned to help prevent water leaks caused by restrictions. Records are kept on file and compared with previous reports to detect gradual changes. A 10% discount if service is needed at a time other than scheduled maintenance. Top Performance customers will be served before non-agreement customers. Tackified filters available at an extra charge. Condenser coil will be inspected and cleaned for heat transfer loss. Fans will be inspected and cleaned to assure proper air delivery. Refrigerant will be checked for proper charge and to assure there were no leaks. Controls and safeties will be tested as needed. Condensate drain will be cleaned to help prevent water leaks. Relays and contractors will be inspected. Unit wiring and electrical disconnect will be inspected. Evaporator coil will be inspected and cleaned chemically in place. Amp draw on heat strips will be checked to know that they are heating correctly. Defrost cycle will be checked if system is a heat pump. Furnish inspection report and advise of abnormal conditions or necessary repairs. Outdoor Unit – Inspect the outdoor unit for clogged condenser coil (grass cuttings, leaves, dirt, dust, lint or bushes). 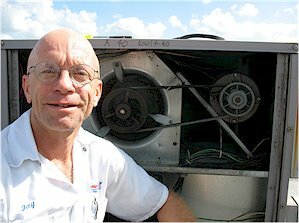 Ensure that branches, twigs or other debris are not obstructing the condenser fan. Thermostat setting – Make sure that the system switch of the thermostat is “on” or switched to the correct mode (“heat” or “cool”) and that the temperature is set low enough for cooling or high enough for heating. Energy management system – If the power company has a load management device, learn from them what the lights on their control box mean. Circuit Breaker – If either unit does not run (most homes have two sections – indoor and outdoor) check the circuit breaker. Some breakers do not show that they are tripped. Shut it off all the way and switch it back on again to be sure that it is reset. Only try this once. If it trips or the system stops soon, you have a problem that needs service. What’s that cloud of steam coming off my heat pump? – In heating season or cold weather, outdoor heat pump sections may accumulate frost during certain operating conditions. Defrost cycles will run until all frost is melted or for up to ten minutes before switching back to the heating cycle automatically. The cloud you see coming off your heat pump is merely water vapor condensing into a mist in the cold outside air. No air blowing – If there is no air blowing at the indoor registers there may be ice on the indoor coil restricting airflow. At the thermostat set the fan to “on” instead of “auto” and set the heat/cool/off switch to “off” to allow the ice to melt. And call for service. Integrity Air can help you with your air conditioning needs. We service all the major brands — just check the list below. If you don’t see the brand name of your unit, call us.